This is a post I’ve been trying to get to since I started blogging a couple of years ago: how to re-attach a detached SUSPECT database. This is a pretty common scenario I see on the forums – a database goes SUSPECT so the DBA tries to detach/attach, which fails. 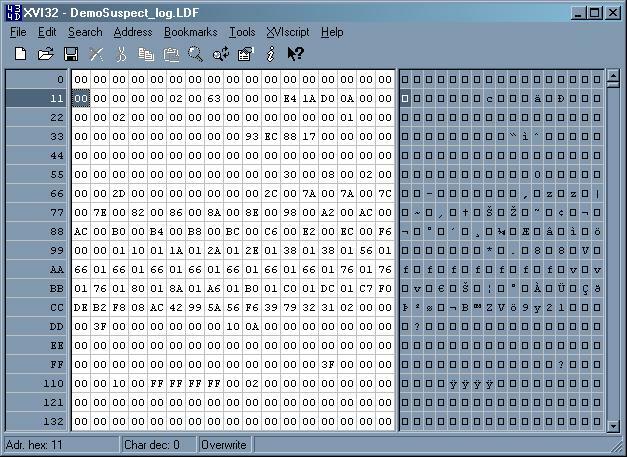 I wrote a demo for my corruption session at TechEd this year that shows how to create a SUSPECT database with a hex editor, then detaches it and shows how to re-attach and fix it. It’s going to be a long blog post, but bear with me – you never know when you’ll need to know how to recover from this. First off I’m going to create a simple database to use, called DemoSuspect with a table and some random data. Now I’ll perform an update in an explicit transaction and force it to be written out to disk with a CHECKPOINT. I’ve accidentally deleted Kimberly’s bonus! When I start up SQL Server again, it will try to run recovery on the DemoSuspect database and fail. This will put the database into the SUSPECT state. So I restarted SQL Server, let’s try getting in to the DemoSuspect database. At this point, the correct procedure is to restore from backups. If there are no backups available, then the next best thing is to get the database into EMERGENCY mode and extract as much data as possible, or run EMERGENCY-mode repair. However, I’m going to try the detach/attach route instead. I was *so* pleased when I saw this change was made. I’m going to have to set the database offline to release the NTFS-locks on the files, copy the files to somewhere safe, then drop the database and delete the files. It’s no longer possible to accidentally detach a SUSPECT database. Now the DemoSuspect is really detached from SQL Server, and now the fun starts, which is why I’m sure many of you are reading this post. The header for file 'C:\Program Files\Microsoft SQL Server\MSSQL10.MSSQLSERVER\MSSQL\DATA\DemoSuspect_log.ldf' is not a valid database file header. The PageAudit property is incorrect. The header for file 'C:\Program Files\Microsoft SQL Server\MSSQL.1\MSSQL\Data\DemoSuspect_LOG.ldf' is not a valid database file header. The PageAudit property is incorrect. File activation failure. The physical file name "C:\Program Files\Microsoft SQL Server\MSSQL.1\MSSQL\Data\DemoSuspect_LOG.ldf" may be incorrect. Could not open new database 'DemoSuspect'. CREATE DATABASE is aborted. File activation failure. The physical file name "C:\Program Files\Microsoft SQL Server\MSSQL10.MSSQLSERVER\MSSQL\DATA\DemoSuspect_log.LDF" may be incorrect. Hmm. The database knows that there was an active transaction. Using the ATTACH_REBUILD_LOG command only works if the database was cleanly shut down and the log is missing. Even removing the damaged log file makes no difference. Basically the problem is that the database wasn’t cleanly shutdown, which means that recovery HAS to run and complete before the database can be attached again. Given that our log file is corrupt, that’s impossible. So, never detach a suspect database. The only way to get the database back into SQL Server is to use a hack. I’m going to create a new dummy database with the exact same file layout as the detached database. Then I’m going to set the dummy database offline, swap in the corrupt database files, and bring the database online again. If all goes well, the corrupt database will be attached again. The one major downside of this is that if the SQL Server instance doesn’t have instant initialization enabled (see How to tell if you have instant initialization enabled? ), then creating the dummy database could take a long time if the data files are very big. This means that your application is offline while the files are created and zero’d out. You’ll need to delete the existing files. Before doing this you want to make absolutely sure you’ve got multiple copies of the corrupt database files… just in case. After deleting the files, I can create my dummy database and set it offline. Cannot create file 'C:\Program Files\Microsoft SQL Server\MSSQL10.MSSQLSERVER\MSSQL\DATA\DemoSuspect.mdf' because it already exists. Change the file path or the file name, and retry the operation. Database 'DemoSuspect' cannot be opened due to inaccessible files or insufficient memory or disk space. See the SQL Server errorlog for details. Woo-hoo – I’m back to having a SUSPECT database attached again – after having to mess about deleting and copying files around. Not good. Now I can actually fix it. If you don’t have any backups, then the only way to get into the database is to use EMERGENCY mode. This lets you into the database but you need to be aware that recovery has not completed so the contents of the database are transactionally (and possibly structurally) inconsistent. I’m going to choose to repair the database using EMERGENCY-mode repair. See CHECKDB From Every Angle: EMERGENCY mode repair – the very, very last resort for a detailed description of this tool. Note that you have to put the database into EMERGENCY and SINGLE_USER modes to do this. The Service Broker in database "DemoSuspect" will be disabled because the Service Broker GUID in the database (B72D1765-80C6-4C2F-8C12-5B78DAA2DA83) does not match the one in sys.databases (001AE95A-AE22-468F-93A4-C813F4A9112D). Warning: The log for database 'DemoSuspect' has been rebuilt. Transactional consistency has been lost. The RESTORE chain was broken, and the server no longer has context on the previous log files, so you will need to know what they were. You should run DBCC CHECKDB to validate physical consistency. The database has been put in dbo-only mode. When you are ready to make the database available for use, you will need to reset database options and delete any extra log files. First off it tries to do the regular ATTACH_REBUILD_LOG. When that fails, DBCC CHECKDB takes over and forces the log to be rebuilt, after trying to force as much of the damaged log to be processed for recovery as it can. It then runs a full repair, in case there’s anything corrupt in the database – in this case there isn’t so there are no corruption messages in the output. Notice the line about the Service Broker GUID being wrong. I had to use the hack method to get the database attached again, but when I created the dummy database, it created a Service Broker GUID for the DemoSuspect database in master.sys.databases. When I swapped in the corrupt database, it has a different GUID – so now I can’t use Service Broker until the Service Broker GUID is reset using the NEW BROKER option of ALTER DATABASE (see this post for details). So what’s the state of the data after all of that? -- What about the data? Kimberly doesn’t get a bonus this year – she won’t be happy! This is contrived and flippant, of course, but it illustrates the point that after doing an EMERGENCY-mode repair, transactions that were active at the time the log was damaged will not get a chance to roll-back, most likely. In this case, I know what was going on when the crash occurred, but what about on a busy OLTP system with hundreds or thousands of active transactions? What state will the data be in? Yes, you can recover from a detached SUSPECT database, but it’s not pretty and you have to be very careful. The best course of action is always to have a comprehensive backup strategy that allows you to restore as quickly as possible. If you do have a SUSPECT database and no backups, use EMERGENCY mode to access and/or repair the database. Hopefully this article will help people that find themselves in these situations – let me know if it helped you. Is there any way to recover a detached database with a corrupt file header in a secondary file? Long story short, some months back I had a detached database (detached for a good reason) with two files in the primary filegroup, few other files in other filegroups and, as far as I could tell, the second file in the primary group had a whole bunch of damage, including to the header page. So what happens after you are up and running? Should you do a full backup before you can take log backups or do any other maintenance? Should you recreate the database so that the GUID problem is fixed? Hey Rob – well, it totally depends on how you want to move forwards. Do you really want to stay on the same hardware that corrupted the database? Do you want to keep using that database knowing that the data within it is transactionally inconsistent? If you want to use Service Broker ever again then you’ve got no choice but to create a new database – if not then it’s not relevant. Yes, if you want to continue using this database and taking log backups then you’ll need to take a full – rebuilding the log breaks the log backup chain. i am using sql server 2000. yesterday my server shows blue screen after that when i start again it was showing messges like registry or system files corrupted…. I/O error. i don’t have latest backup. so i want to know after recovering ldf file from HDD can i would be able to get back my original database. pls help. I’ll let your thread on sqlteam.com handle this. Database ‘CLM’ is being recovered. Waiting until recovery is finished. Is there a way to force the database to actually get into Emergency status? The only way to do it in your case is to shutdown the server, remove the log file and then do the same set of steps. The recovery system has got itself into a twist based on corruptions in your log. Hope this helps. Thanks for your approach, very useful. Hi, thank you, its works for me. Look at abouve solution. I tried restore database any forms, but i can’t. System.Data.SqlClient.SqlError: The media set has 2 media families but only 1 are provided. Nice article, you helped me a lot! Recently my database was stopped because of insufficient space for log file. The mount volume was full. SQL server had restarted the database and database went into recovery state. It is a large database (4 TB),so it took its own sweet time to recover (13 hours!). I was not able to take it in Emergency mode (Same error as “Gabriela Nanau”). During such scenario, can we shutdown the SQL Server,remove the file and do the given steps? Will be get any time advantage or should we always wait for database to recover itself? You could, but I would never do that as you will be corrupting your data and possible your database. You need to let the crash recovery complete. There’s no alternative without causing data loss + corruption. Hi, I also can confirm that this really works. Many thanks, Paul! SQL Server Assertion: File: , line=476 Failed Assertion = ‘pHoBtAccess->GetHoBtColumnCount () > 0’. This error may be timing-related. If the error persists after rerunning the statement, use DBCC CHECKDB to check the database for structural integrity, or restart the server to ensure in-memory data structures are not corrupted. Any idea what this means and what can be done to resolve this? Yes, you’ve got metadata corruption and need to restore from your backups. A life saver although I only had to recreate the databases & replace the files with the suspect ones & all was well. Thanks Paul, this article saved me a lot of time. First time it happened and it worked flawless on a sql server 2008 r2. You rock! Thank you very much. You save my day thanks. Thank you, Paul very much! I have a database that was detached cleanly however when reattaching it using Management Studio there was permissions problem with accessing the LDF file. An error was thrown and the attach dialog said that because it couldn’t access the old log file it created a new one. The DB got attached and it’s now online and because it’s not a critical DB I think I’m fine. The problem is I’d like to point the DB back to the original ldf file since I do have it but everything I’ve tried throws an error saying that it doesn’t match the MDF. Any idea on how to do this? Most scenarios I’ve seen described similar to this are cases where people want to attach the mdf and the ldf file is missing but I actually have a perfectly good ldf. You can’t now that there’s a new log file. There’s no need to do so either. You’ll just need to grow the new log file to whatever size it was before, as the new one will only be 0.5MB with two VLFs. This was extremely helpful! It saved me a BUNCH of effort, so thank you! I just have a minor modification that might be related to my use of sqlserver express. After I took the dummy database offline and copied over the corrupted database, when I tried to bring it back online it failed. So I had to run a restore task on the database. The restore process failed, but it came online and allowed me to run queries on the database. We did a checkpoint ,so the data went to mdf file.But server didnt shut down properly and the log file was made corrupt by us,so sql after restarting tried to rollback uncommitted transactions,but due to corrupt log file,it was not able to do. So when we ran DBCC check DB ,mdf file was not corrupt ,so we were able to bring database to state before shutdown . Yes, it was the state before shutdown – with the effects of the uncommitted transactions still in the database as they were not rolled back. Your data is transactionally inconsistent and you need to manually figure that out based on your knowledge of the workload and possible in-flight transactions. Stupid question here, but what if it is the master database? You can’t detach the master database. If it’s suspect, the instance won’t start and you need to rebuild master and then restore from your most recent backup, and then recreate all server-scoped objects created since your last master backup. I really hope it can help me, but I have gotten into some problems. I’m not experienced in handling problems in MSSQL. I had a server crash about two weeks ago and sorry to say I had no backup. What is worse is that the Whole accounting system for my two Companies was on that server. I have managed to copy out all the important data through the program to datarecovery.com. Whats left is getting to use the files. I am not exactly sure what did crash the server. It migt be the disk getting full. Anyway I was entering the database in this case at the time when I discovered the problem. The data files was on another partition on the same disk as the system boot (that get full). I did try to follow Your guide to create an identical database as you discribe set it ofline, canged the database files and tried to set it online again. I had to rename the log file from AxNF.ldf to AxNF_log.ldf in that process. Not sure if thats the way to do it. If that will work. Database ‘AxNF’ cannot be opened. It has been marked SUSPECT by recovery. See the SQL Server errorlog for more information. Cannot open database “AxNF” requested by the login. The login failed. Login failed for user ‘AX\geir’. I was a little quick. The database got into suspect mode. Setting it into Emergency mode was sucsessful. Setting it into single_user mode was sucsessful. Cannot open database ‘AxNF’ version 655. Upgrade the database to the latest version. I am pretty sure both severs are 2008r2. If the old one is an older Version what do I do now? You’ll need to take the database back to a 2008 server and attach it there. Emergency mode won’t work if the database needs to be upgraded. I know this is an ancient post but I wanted to say thanks a bunch — this really came in handy. And now we have a solid backup strategy as a result. You really helped me dodge a bullet. Much appreciated. The database ‘base’ is recovering. Waiting until recovery is finished. Not the right way to get urgent help – luckily I happened to be doing email when this comment came in. Try setting the database online again. If it doesn’t work, you need to go back into emergency mode and extract everything into a new database, or restore from your backups. Paul, I don’t have any backups of it. Can be possible to recover a database and get it back to online again? My current database status (using DATABASEPROPERTYEX) is EMERGENCY, but if I check using DBCC CHECKDB the information of database is raising error code 922. Try setting it offline and then online again. If EMERGENCY-mode repair doesn’t work after that, you’ve lost the database. Awesome, worked great on a development VM running SQL 2005 where two databases were suspect and I detached them. This worked nicely on a database where the power cut out while in the midst of configuring it for a go live in 3 days. This had left the database “suspect”. Thanks! Thanks yet again. I have been using this for a while now with a few clients. After hacking them up for a while (100 gig sizes) we prevailed with minimal data loss. Congratulations ! You are a life saver ! Hi…im trying to use this blog to resolve the same problem im having but unfortunately the database that having the “The header for file ‘C:\Program Files\Microsoft SQL Server\MSSQL10.MSSQLSERVER\MSSQL\DATA\DemoSuspect_log.ldf’ is not a valid database file header. The FILE SIZE property is incorrect” error message is msdb. so when got to creating a dummy msdb and taking it offline, i got the msg “Option ‘OFFLINE’ cannot be set in database ‘msdb’.” Please how can u help me? Msdb is more complicated and beyond the scope of a comment reply. I recommend you restore from your msdb backups or just recreate msdb from the install media (see http://msdn.microsoft.com/en-us/library/dd207003.aspx) and then restore backups of the other system databases. Make sure you practice and know what you’re doing before you do this for real. Thanks really nice article. What happens if the database was involved in replication either publisher or subscriber? Than you’ll need to reinitialize the replication topology. Recently days, we encounter the same issue. We did everything like this post blog says. 1.create new database and replace mdf & log. 3.but when we use checkdb, we failed, failed at the last step. Database ‘xxxx’ cannot be opened due to inaccessible files or insufficient memory or disk space. See the SQL Server errorlog for details. Are you sure all the data files are there? I don’t have any backups. Database is in Emergency mode. and I have only 25GB in drive. Transaction log files are full. DBCC is not working because of space issue. What is your suggestion? How can I delete the transaction Log file when the database in emergency mode. Thank you for your help. You shouldn’t do that. Create more space on the drive. Standing the tests of time. We had a corrupt Tran Log here at the office for one of our Production systems. I followed these steps and we are back. save my database with inexistent log file and database corrupt!! Database ‘XXXX’ cannot be opened. It has been marked SUSPECT by recovery. See the SQL Server errorlog for more information. During redoing of a logged operation in database ‘XXXX’, an error occurred at log record ID (0:0:0). Typically, the specific failure is previously logged as an error in the Windows Event Log service. Restore the database from a full backup, or repair the database. An error occurred during recovery, preventing the database ‘XXXX’ (database ID 7) from restarting. Diagnose the recovery errors and fix them, or restore from a known good backup. If errors are not corrected or expected, contact Technical Support. SQL version : SQL server 2008 SP4. Emergency mode repair or restore from backups. Thank you very much for this post. It helped one of my customers again (I have used it some times over the years). Really helpful, and if you ever come to Denmark (or if I ever again participate in some of your brilliant courses), then I owe you a beer. I can’t identify which repair level is it, because in the msdn’s article about “dbcc checkdb” only talks about three repair parameters: REPAIR_ALLOW_DATA_LOSS | REPAIR_FAST | REPAIR_REBUILD. And, I don’t find any reference about use “repair” alone. Thanks Paul, your article was very helpful! There is no such option. As my post shows, you have to use REPAIR_ALLOW_DATA_LOSS. Does anyone have any time frames for the completion of the DBCC? This has been executing for nearly 2 hours now…. It takes as long as it takes – I can estimate if I know your schema and hardware but only way to know for sure is to run it regularly. This just saved my life!!!! Nearly lost 2 years of work when a power cut shut down my PC halfway through an executable on a table containing over 10million rows of data…. 4hour recovery but all as was. how about this solution when we have problem with log file? I don’t like recommending that as it doesn’t even attempt to recover transactions from the log – just throws it away completely, and doesn’t do any consistency checks. People may run that and then move on, without realizing that their database is corrupt. Thanks again for a great article. A co-worker had moved some files to new drives and this is what I received a call for. I followed what you have discussed above and everything is working great. Since SQL was shut down before the files were moved I wasn’t too worried about data corruption. I was able to bring everything back online and using the new drives, thanks to you!!! You’re welcome – glad I was able to help! I have same problem in Sql 2000 database file. it’s worked and Log file rebuild successfully. Then I run “DBCC CheckDB(‘HIS’)” and get some error. Is there any way to recover my database? Try resetting the database status again. Almost 10 years old and still relevant today :) Thank you Paul! The Sharepoint team changed the default protocol to TLS 1.2 on the servers. After that reboot of the servers many of the databases have been in suspect mode. I have tried to bring them back to online mode using the same below code. But the databases keep coming back to the suspect mode. Is there any way to for my databases to not go back that way? It worked! Thank you for this! Can you run a recovery with a dummy log file during RESTORE operation. One of our non-prod database turn into a SUSPECT mode while running a RECOVERY during RESTORE operation. RESTORE WITH NORECOVERY runs fine but when we run the final step of RECOVERY it chokes and run into a SUSPECT mode. Does that mean that log file was already corrupted during backup? we are not in a emergency situation but would be nice know if database can be recovered with a dummy log file during RESTORE similar to detach-attach. No, you can’t do that. And no, it’s more likely that something in a data file was corrupted that prevented rolling back a transaction as part of the final recovery phase of the restore – that will always make the database suspect. You can try putting the database into EMERGENCY mode, otherwise you’ll need to experiment with which log backup causes the failure and you’ll only be able to restore to there. One other thing to try is using WITH_CONTINUE_AFTER_ERROR on the final recovery phase, and then you’ll need to perform and emergency-mode repair. Thanks Paul, WITH_CONTINUE_AFTER_ERROR helped me to move to a next step. Restore operation failed for database ‘errored_out’ with internal error code ‘0x82000008’. Ah – you’re stuck I’m afraid. There’s no workaround if you have in-mem objects. You’ll need to go back to just before the log backup that causes the database to go suspect. Thanks Paul for Prompt replies. Fortunately, it was a non-prod instance and we have had some good backups too. Some interesting turn in this corruption story. I still had that corrupt backup and was trying to learn something out of it in my free time. Surprisingly while trying different RESTORE options I found that I could restore the corrupt database on a machine where we had latest patch installed ( SQL Server 2016 SP2 + CU1). Corruption error persist on SP1 + CU6 though. Do you think latest patch handled some edge case our backup encountered and it was not a real corruption? hello,paul! I want to ask you a question? what’s the different that the dbcc checkdb will do in the following two situation? does there anything different? or just because if the db is suspect or recovery pending,it must be set emergency mode first? @Jon S: Certainly sounds like it! Just another software anomaly. I am scared to see self driving cars on free way!! Holy crap. I can’t believe that worked. I think we just became best friends! Thanks Paul! Thanks for a great post. A client wanted to monitor the state_desc column in sys.databases for a value of SUSPECT. Overwriting the start of the log file returns SUSPECT from SELECT DATABASEPROPERTYEX (N’DemoSuspect’, N’STATUS’) AS N’Status’; but sys.databases shows RECOVERY_PENDING. By overwriting the middle of the log file, I was able to get sys.databases and sys.databases to reflect SUSPECT. Wanted to share in case anyone else had the same issue. Once again, thanks for this post and all of the work you do to share your knowledge.